After two days of hard work the team is feeling a little tired this morning. What we don’t know is that today will turn out to be the best day yet. 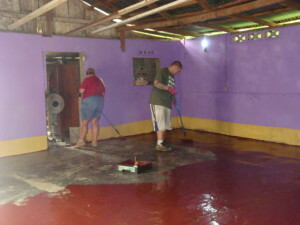 We head out at 8AM to Pastor Jose’s house and begin to hang doors, finish up any painting, and put the final coat of epoxy on the floor. These tasks do not take very long to complete. While at the market the day before, Weston and Dalen, bought a pinata and candy to take to the barrio for the kids to smash. Winnie the Pooh is hung from a tree, a stick found, and blindfolds applied. 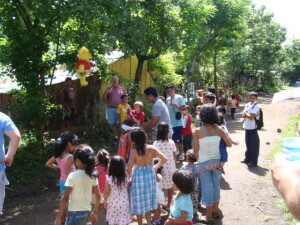 I wish you could have seen the excitement in these Nicaraguan children’s eyes as they took their turn to hit the candy stuffed bear. At first his legs fell off then finally he burst open. The scrum of children was almost violent. When was the last time, if ever, these kids had candy? 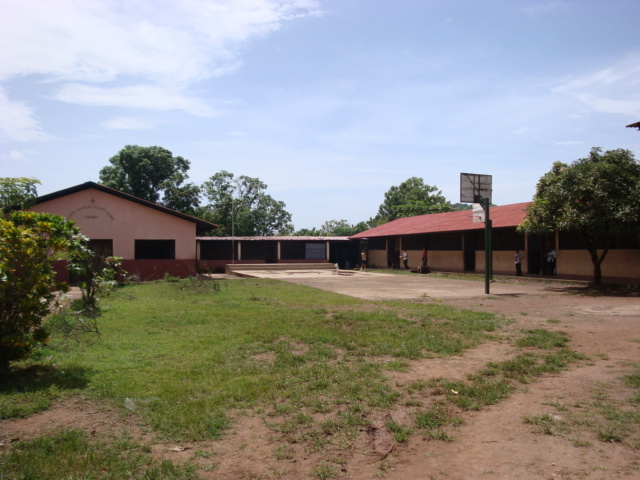 After cleaning up our mess we load up and head to a local school that Mitch Marsh Ministries helps support. We had bought 3 gallons of cooking oil to take them as we had heard they might be out. Most of the children have gone home by the time we arrive but there was still one classroom full of kids who want to be loved on by the gringo’s. The man that runs the school tells Mitch and a few of us how they no longer could afford propane to cook with on their stove and had gone back to cooking on wood in the floor of the kitchen. A tank of propane cost $12 and last for 15 days. We make arrangements for them to get two tanks of gas. 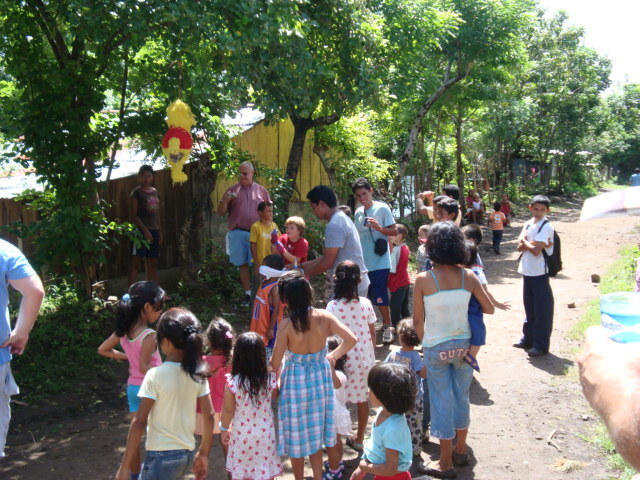 Mitch goes into the classroom and leads the children in a couple of songs before we load up in the van to head to Pastor Jose’s church. The church has seen some progress since the last time I visited it. The block walls are now complete all the way around. This large building is now ready for a roof and floor. In the center is a small shelter where the congregation currently meets. 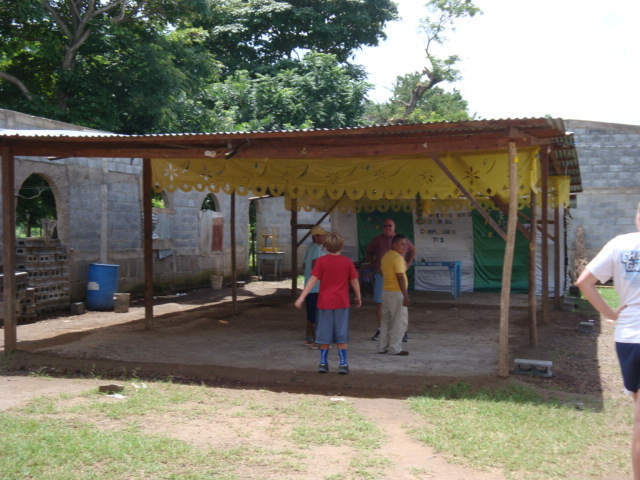 Pastor Jose explains to us that when it rains they have to dismiss because his crowds are too large to fit under the temporary structure. That is a great problem to have but still a problem. Our team prays with Pastor Jose in one of the most Spirit filled moments I have ever experienced and we begin to make plans to help this church get completed. After tears are wiped away and hugs go out we make our way back to the Marshes for lunch. As always our sandwiches are wonderful thanks to Judy and Fran and after eating we head to Lake Nicaragua for a boat tour. The lake is the 19th largest in the world so you cannot see across it and it reminds you of being on the ocean. 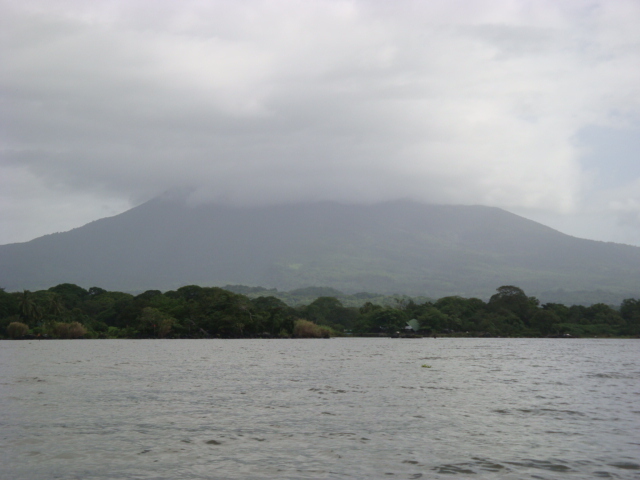 We troll around the small islands created by volcanic rock that now contain the homes of Nicaragua’s wealthiest people among others. 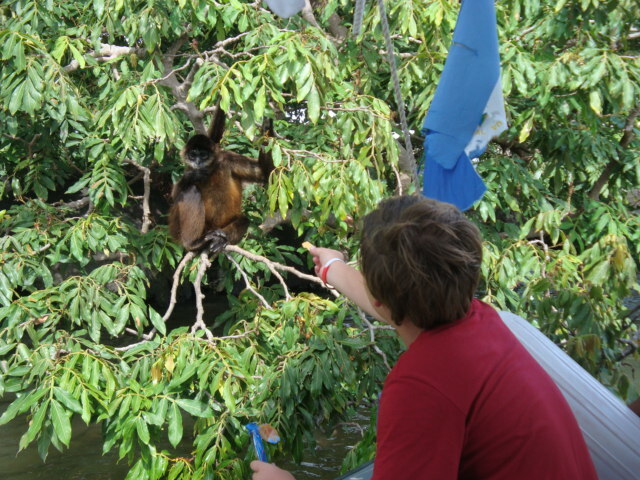 There is even a small island that contains monkeys that like to be fed. After about an hour on the lake we load up the van and head back to Pastor Jose’s house to see if the floor is dry enough to place the furniture back on. It is not quite dry enough so the family will have to spend one more night sleeping in the kitchen and outside. We will return first thing the next morning to get the house back in order. We head out just before 8AM again and go straight to the “supply store”. I use that term loosely as the small, outside only retailer, has lumber and some basic construction tools. 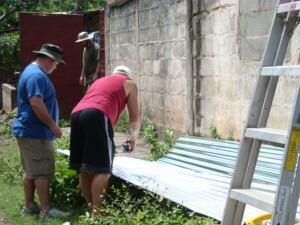 We are here to pick up some plywood to repair one of the doors to Pastor Jose’s house that has completely rotted out. After loading the materials onto the roof of the van we head to the paint store to pick up the epoxy for the floor. Once on site the team quickly gets to work touching up paint, repairing the broken door, and removing and painting the other doors of the house. The first coat goes onto the repaired and swept concrete floor as soccer games break out in the road in front of the house. This day moves by more quickly as lunch arrives. We thank Mrs. Judy and Fran for their hard work in feeding our bellies and then get back to work putting final coats on the trim and a second coat on the floor. Also during this time a six-foot section of tin roofing is added to Pastor Jose’s front porch to repair an area that had been missing. 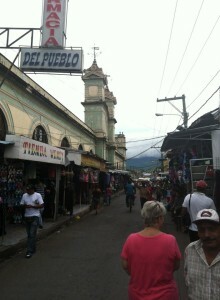 It will take the rest of the day for the floor to dry so the team decides to head to the market in Granada to experience shopping as as a Nicaraguan. 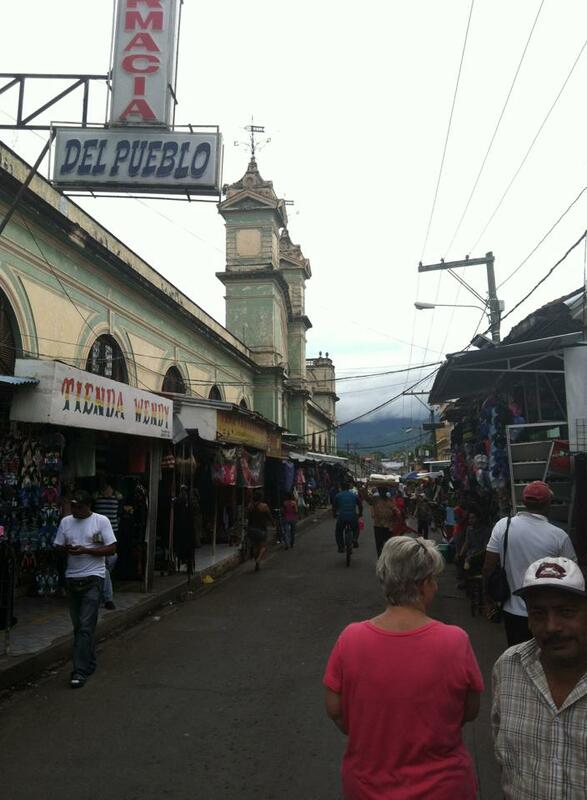 The market consists of several city blocks of wall to wall stores, flea market style setting, and people. You can find pretty much anything you need here from electronics, to clothing, to food. The smell that comes from the meat area is unlike anything you can imagine. It is 90 degrees, 80% humidity, and they are gutting fish right there at their table. I don’t stay in this area very long. A small group of us have Francisco take us up to Central Park. 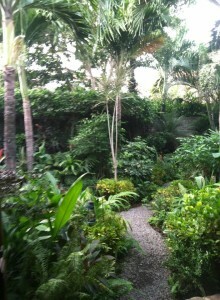 As you would guess it is in the center of the city, has tree’s, and is bustling with activity. A few small souvenir purchases are made and we make our way back to the meeting spot to head back to our house. The rest of the afternoon is spent showering and relaxing. For dinner we head to the Garden Cafe. 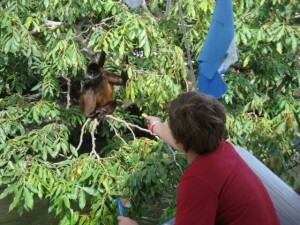 It is downtown Grenada set in an old colonial style home. There is actually a beautiful garden located in the center of this open air restaurant and the food that accompanies the setting is a delight as well. With bellies full we make our way back to La Casa De Marsh and get ready for bed.